Profile 00: Messerschmitt Bf 109E.1 'Black 3', probably of III./JG77, Bulgaria, early 1941 This Bf 109E-1, which has been fitted with a square canopy and head armour, has a replacement panel covering the fuselage-mounted MG 17s. The aircraft previously served with JG2 and the 'Richthofen' shield of this unit under the windscreen consists only of the red outline and script letter 'R' placed directly onto the Blue 65 of the fuselage side. Uppersurface camouflage is believed to have consisted of the standard 71/02 scheme. Photo 01: The pilot of this Bf 109E-1, which had previously seen service with JG2, barely succeeded in reaching Vrba (Sofia) airfield, the base of II./JG27. Although it clearly bears the horizontal Gruppe bar and 'Richthofen' shield of II./JG2, when photographed this machine was probably on the strength of III./JG77 which used aircraft previously flown by I. and II./JG2, II. (S)/LG2 and JG54. Profile 00: Messerschmitt Bf 109E 'White 11' of III./JG77, Balkans, May 1941 Although operated by III./JG77, this aircraft, an E-3 or an E-4, retains the 'Lion of Aspern' badge of II./JG54 on the fuselage. The fuselage camouflage is believed to have consisted of locally mixed medium grey patches and meandering Green 70 lines. Photo 01: Still wearing the 'Lion of Aspern' badge of II./JG54, 'White 11' obviously served with that Gruppe before being taken over by III./JG77. Also characteristic of JG54 is the fuselage camouflage pattern of meandering green lines which JG54 introduced in combination with patches of RLM 02 during the final stages of the Battle of Britain. However, by comparing the 02170 wing camouflage with that on the fuselage, it would seem that the original 02 patches on the fuselage have been replaced by a locally mixed medium grey. In any event, the camouflage has been invalidated by the bright yellow areas on the cowling, mdder and wingtips. The machine was photographed in May 1941, and although an impressive array of victory bars is visible on the mdder, the name of the pilot is not known. Profile 00: Messerschmitt Bf 109E 'White 3' flown by unknown pilot of 4./JG77, who did a perfect job of belly landing his cripled machine Greece 1941. Profile 00: Messerschmitt Bf 109E.4 'White 5' flown by Lt. Jakob Arnoldy of 4./JG77, Larissa, Greece, 15th April 1941 This aircraft, W.Nr. 1276, was finished in a standard 02/71 scheme with extensive areas of yellow and an overall appearance of being generally well used. In particular, the yellow nose was well weathered and there were signs of some repainting around the tail area. Despite having six victory bars marked on his rudder, Lt. Arnoldy was credited with a seventh a Hurricane, shot down shortly before he made a forced landing on Larissa aerodrome. As mentioned in the main text, his subsequent fate is unclear. Photo 01: On 15th April 1941 , Lt. Jakob Arnoldy of 4./JG77 had to make an emergency landing following an engagement with Hurricanes. Arnoldy carried out a successful emergency landing on the British-held airfield at Larissa but his subsequent fate is unknown. Here, Arnoldy's aircraft, a Bf 109E-4, W.Nr 1276, coded 'White 5' is being inspected by a Commonwealth pilot. Photo 01: Allied soldiers caught obviously having a quick smarten-up in the presence of the photographer in this view of the tail of 'White 5' showing Lt. Arnoldy's six victory bars. Note the yellow elevators, the areas of repainting around the Hakenkreuz and the repairs to the rudder fabric. Photo 01: On 15th April 1941 , Arnoldy engaged RAF Hurricanes as they were taking off from their airfield at Larissa and shot one down as his seventh and last victory. He was wounded in the chest by fire from Canadian ace Flt Lt John Mackie’s (7 victories) 33 Sqn, RAF Hurricane and baled out. As he floated down over the airfield Greek soldiers fired on him. It is not known whether he was hit again but he died within a short time. His aircraft, Bf 109 E (W.Nr. 5277) “White 5” made an almost perfect belly landing and was virtually undamaged; just two bullet holes below the cockpit hood, in line with the pilot’s chest. Photo source A picture of a Me 109 from the book "wings over Olympus"
Photo 01: Messerschmitt Bf 109E 'Black 1' flown by Ofw. Werner Petermann of 5./JG77 This aircraft, W.Nr. 3487, was originally constructed as an E-1 but was later modified to E-7 standards. The original MG 17 wing armament was removed and MG FF cannon fitted, together with the later, square type of canopy with pilot's head armour. The aircraft retained its uncapped spinner and the original MG ports in the wing leading edge were still visible inboard of the cannon. The aircraft's finish consisted of a 71/02/65 scheme with the cowling, rudder, wingtips and a thin band around fuselage in yellow. Photo's 01-02: On 20 May 1941, the first day of 'Merkur', four aircraft of II./JG77 were lost. This aircraft, 'Black 1', the Bf 109E-7 W.Nr. 3487 flown by Ofw. Werner Petermann of 5./JG77, was attacking Allied positions on Crete when it was shot down by ground tire. Petermann crash-landed on the beach near Canea and his machine came to rest close to an RAF Hurricane which may be seen in the background. Ofw. Petermann was taken prisoner and was later held in New Zealand. He returned to Germany after the war. Profile 00: Messerschmitt Bf 109E.1 'Black 8' flown by Uffz. Heinrich Brunsmann of 5./JG77 5. Staffel of JG77 was a Jabo Staffel, hence the bomb rack fitted beneath this aircraft which had also been updated with a square canopy and curved head armour. The aircraft was camouflaged in standard 71/02/65 colours with the Blue 65 on the fuselage covered first with 02, but leaving areas of 65 visible particularly around the markings, followed by a fairly heavy application of Green 71. The emblem is the 'seeadler' (Sea Eagle) badge of II./JG77. Profile 00:Photo 01: Uffz. Heinrich Brunsmann's Bf 109E-1 'Black 8' of 5./JG77 after making a forced landing at Almiros on 22 April 1941. Profile 00:MesserschmittBf 109E 'Black 8' of 5./JG77, Molaoi, Greece, May 1941 Still retaining an early, rounded canopy, this aircraft was otherwise converted to E-3/B or E-4/B standard with curved head armour and a bomb rack. The high demarcation 71/02/65 camouflage shows signs of weathering, particularly under the cowling and over the wing root which has been darkened by an exhaust deposit. Note also the black carbon deposits close the machine-guns in the engine cowling and from the cannon in the wing leading edges. Photo 01: With its tyres protected from the sun, this Bf 109E of 5./JG77 at Molaoi in May 1941 has already been loaded with a 250 kg bomb prior to sortie to Crete. The spinner, nose, rudder and wingtips have been painted yellow, but the yellow on the leading edge of the wingtips is badly eroded as a result of the abrasive dust on Balkan airfields. Photo 01: This Bf 109 Yellow 2 of 6./JG77 was photographed in May 1941. The Seeadler emblem immediately behind the supercharger intake indicates that this aircraft was originally on the strength of II./JG77 before being taken over by III. Gruppe, the emblem of which has been applied to the engine cowling. This machine also displays a modified camouflage scheme in that while the fuselage appears to be a standard 02170 mottle, the wing uppersurfaces have been toned down with an overspray of either 02 or a mixed light grey. Photo 01: Fw. 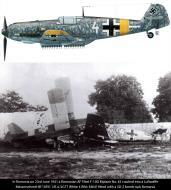 Johann Pichler crashed Bf 109E-7, WNr..1963 at Molaoi after returning from an attack on the Royal Navy battleship HMS Warspite on 22 May 1941. Classified as having received 85% damage, the aircraft was a write-off. Note the high aircraft number painted on the fuselage of this aircraft which was possibly delivered to the unit only several days earlier. Photo 01: Fw.Johann Pichler of 7./JG77 photographed at Molaoi with his Bf 109E-7 'White 2', W.Nr. 1094931. In this view, an auxiliary fuel tank is visible below the fuselage and the aircraft is standing on an area of pierced steel planking. Photo 01: A lineup of III./JG77 aircraft. Many of these aircraft whilst serving with JG77 would later be lost but the correct number of aircraft lost or damaged during the Balkans campaign is not known as many went unrecorded in the official statistics. Profile 00: Messerschmitt Bf 109E 'Black 5' of 8./JG77, Larissa, Greece, 21 April 1941 On this aircraft, finished in the colours 71, 02 and 65, the 02 on the fuselage has been sprayed to avoid the fuselage cross and then darkened with mottles and streaks of 71 before the number '5' and Gruppe symbol were applied. The fin is marked with a single black victory bar and the yellow rudder shows areas of the original Blue 65 where the yellow has stripped away. As quite frequently observed, the Gruppe symbol has been incorrectly applied. Photo 01: This Bf 109E, 'Black 5' of 8./JG77, was photographed at Larissa on 21 April 1941. Profile 00: Messerschmitt Bf 109E.7 'Black 10' of III./JG77, ex-JG54, Balkans, May 1941 As is evident from the emblems on the nose and ahead of the windscreen, this aircraft originally served with JG54 and carries one of the camouflage schemes devised by this unit during the latter half of 1940. Eight victory bars are carried on the yellow rudder, and it is believed the first two were capped with French roundels and the remaining six with RAF roundels. The camouflage colours probably consisted of mixed greys with meandering 70 lines enhanced with further grey lines and patches. The name 'Lilo' was painted in red and white under the canopy. Note the yellow wingtips and the remains of a narrow yellow strip along the trailing edge of each wing which was applied to both upper and lower surfaces. The wolf's head emblem applied when this aircraft was taken over by III./JG77 is unusual in being tan rather than the more frequently seen black. Photo 01: To judge from 'The Lion of Aspern' badge under the windscreen, this Bf 109E-7, 'Black 10', previously served with IL/JG54 before being handed over to III./JG77. Several sources have stated that this aircraft was previously flown by Oblt. Hubert Mütherich, and the nationality of the kill markings, barely visible. Photo 02: have been interpreted accordingly in the accompanying colour profile. Unexplained, however, is the fact that although Mutherich was the Staffelkapitan of 5./JG54, the machine clearly has the badge of 8./JG54, i.e. part of III Gruppe, on its engine cowling. Note also the Bf 109E in the background has the black triangle of II.(S)/LG2. Photo 01: Lt. Hubert Mutherich's 'Black 10' of 2./JG77 in early October 1940. By this time, Mutherich was credited with eight victories including a Bloch 152 and a Hurricane during the French campaign on May 1940. During the Battle, Mutherich claimed a Spitfire on 31 August, two more on 4 and 7 September, a Hurricane on the 14th and two Spitfires on the 27th. Photo 03: The same machine clearly showing the badge of 8./JG54. This aircraft initially belonged to Oblt. Hubert Mutherich of 5./JG 54, as indicated not only by the unit marking on the nose, but also by the kill marks on the rudder and the name 'Lilo' under the canopy. After the aircraft was transferred over to III. Gruppe JG 77, it gained not only the 8./JG 54 emblem (the comical bird) and II./JG 54 (the Aspern Lion), but also the wolf head on the engine cowl. The aircraft gained an interesting addition to the camouflage paint in the form of sprayed areas of RLM 70 and RLM 71. The port aileron was a replacement and carried yellow markings. Photographs also suggest that the aircraft could have carried a yellow stripe on the trailing edge of the flaps. At the time of the transference of this aircraft to III./JG 77, this feature became virtually indistinguishable. Mutherich, an ace with 43 kills, died in action against the Soviets, when on September 9th 1941, he made a forced landing after combat with Soviet fighters. He was awarded the Knight's Cross on August 6th 1941. Tento letoun pùvodnì patøil Oblt. Hubertovi Mütherichovi z 5./JG 54, o èemž svìdèí nejen znaky jednotek na pøídi, ale také symboly sestøelù na smìrovce a jméno "Lilo" pod kabinou. Poté, co letoun pøevzala III. Gruppe JG 77, se kromì znakù 8./JG 54 (komický pták) a II./JG 54 (lev aspernský) objevila na krytu motoru také kresba vlèí hlavy, znak III./JG 77. Zajímavým zpùsobem byla doplnìna kamufláž, kdy byly na boky trupu dostøíkány pruhy barev RLM 70 a RLM 71. Levé køidélko bylo vymìnìno a neneslo žluté doplòky. Fotografie rovnìž naznaèují, že letoun mohl na poèátku balkánské kampanì nést žlutý pruh na odtokové hranì vztlakových klapek. V dobì pøevzetí stroje III./JG 77 však již nebyl témìø vùbec zøetelný. Na této stranì návodu je stroj zobrazen s pravdìpodobnou podobou tohoto pruhu. Mütherich, eso se 43 sestøely, padl bìhem tažení v Rusku, když 9. záøí 1941 zahynul pøi nouzovém pøistání po boji se sovìtskými stíhaèkami. Od 6. srpna 1941 se mohl pochlubit Rytíøským køížem. Photo 01: Bf109Es of III./JG77 photographed at Cherbourg-West in late January 1941, at which time ice and snow made flying operations more dangerous. In the right background, 'Black 11' has a large wavy III. Gruppe symbol aft of the Balkenkreuz. Photo's 01-02: Returning from an operation over Crete, a Ju-87 lands at Molaoi. In the foreground is the Bf 109 'Black 11' of III./JG77 with yellow elevators and a narrow strip along the trailing edge of both wings. It carries the badge of the previous owner, 8./JG54, on the cowling. Profile 00: Messerschmitt Bf 109E 'Black 10' of 9./JG77, Greece, April 1941 This aircraft, either a standard E-1 or an E-1 partially modified to E-7 configuration but lacking wing cannon, was camouflaged in a 71/02 scheme with the finish under the cockpit being noticeably darker than the remainder of the fuselage. An early canopy with pilot's head armour was fitted and the spinner nose ring was decorated with a white segment. The emblem of III./JG77 was applied to the nose and the badge of 9./JG77 appeared under the cockpit. Photo's 01-02: Some historians maintain that these photographs of 'Black 10' show the aircraft flown by Uffz. Fritz Borchert of 9./JG77 after it crash-landed on Larissa airfield on 20 April 1941, on which date Uffz. Borchert was indeed posted missing in action in the Larissa area. Luftwaffe records state that Borchert was shot down by anti-aircraft defences, but it is possible that his aircraft was damaged by a Hurricane flown by the top-scoring RAF pilot S/Ldr. Marmaduke 'Pat' Pattle of 33 Squadron, who was himself shot down the same day. Although Borchert is thought to have escaped capture, nothing is known of his ultimate career, possibly because he may have returned to his Staffel with wounds which prevented him from further flying. Assuming the Luftwaffe's loss records to be correct, it should be pointed out, however, that they state Borchert's aircraft, W.Nr. 3282, was a Bf 109E-7, whereas the 'Black 10' shown here more closely resembles an E-1. In this connection it should be noted that most E-7s were not newly manufactured aircraft but were factory modified E-1s, E-3s and E-4s which, although redesignated as E-7s, retained their original W.Nr. It is therefore possible that although this aircraft has no wing cannon and still retains an early, rounded canopy, it may have been an E-1 only partly modified to E-7 standard by fitting an extra internal oil tank to the engine and adding provision for a 300 litre drop tank and bomb release mechanism below the fuselage. The emblem under the cockpit was based on the trademark of a brewery, and the combination of a large Gruppe bar and a small fuselage number is unusual. This aircraft landed with a seized engine, probably due to a loss of oil which was also the cause of the dark stain above the exhaust stubs. Profile 00: Messerschmitt Bf 109E.1 'Brown 12' of 9./JG77, Greece, May 1941 The camouflage on this aircraft consisted of a 71/02/65 scheme with a high demarcation and small 71 mottles over the fuselage. Although an E-1, the aircraft has been modified with the later, squared canopy, curved head armour and capped spinner. Profile 00: Photo 01: Bf 109E-1 'Brown 12' of 9,/JG77 after a forced landing, probably at Molaoi in the Peloponnese, May 1941. Messerschmitt Bf 109E-7 of III./JG77, Molaoi, mid-May 1941 Still retaining the markings of II. (S)/LG2, this aircraft was flown by III./JG77. In common with a number of other aircraft observed in the Balkans, it has been fitted with flat head armour, cannon and a bomb rack but still has an early, uncapped spinner. The camouflage consisted of a 71/02/65 finish with the fuselage sides quite heavily mottled. Note that the cover to the fuel cap above the octane triangle on the fuselage is natural metal. Photo 01: Photographed at Molaoi, mid-May 1941, these aircraft (ABOVE) were previously flown by II. (S)/LG2 but have been taken over by III./JG77 and are shown here having their engines changed. The aircraft closest to the camera is 'White D'. Photo 01: A further photograph showing 'White D' in the background with in the foreground, 'White 4', previously on the strength of I./JG2 and which has again been taken over by III./JG77. Profile 00: Messerschmitt Bf 109E-7 of III./JG77, Balkans, April 1941 Still displaying the fuselage markings of its previous owner, II. (Schlacht)/LG2, and the name of a fallen comrade under the windscreen, this aircraft, finished in a 71/02/65 scheme, probably once had a yellow nose cowling bearing the badge of 5.(Schlacht)/LG2. However, it has since been fitted with a camouflaged replacement cowling upon which is the badge of its later operator, III./JG77. Although it is known that the wolf's head was sometimes in brown, or tan, it is believed that in this instance it was black and appears lighter in the accompanying photograph due to the effect of sunlight. A W.Nr., not legible in the photograph, was painted on the fin. Note that the tips of the propeller blades have worn back to natural metal and that the cover on the fuselage which provided access to the radio has been refitted upside down. Photo 01: This Bf 109E-7 coded '+ L' clearly shows the markings of II. (Schlacht)/LG2 but was operated by III./JG77, the emblem of which was applied to the cowling. The name 'Harry Seidel' painted under the windscreen is in memory of Ofw. Albert Seidel of 5. (Schlacht)/LG2, who was killed on 15 March 1941 during an operation against Britain when his Bf 109E-7, another 'Black L', W.Nr. 3725, was shot down by Hurricanes and crashed into the sea. Photo 01: A line-up of aircraft from 5. (Schlacht)/LG2 showing, second from the right, the Bf 109E-7 named 'Harry Seidel'. This photograph, not taken in the Balkans, was probably taken in France in March 1941, shortly before the unit was transferred to Bulgaria. This aircraft initially belonged to II. (Schlacht)/LG 2, as indicated by the marking consisting of a black triangle and the letter on the fuselage. The inscription 'Harry Seidel' was in memory of Ofw. Albert Seidel, a member of 5. (Schlacht)/LG 2, who was shot down by Hurricanes on March 15th 1941. At the time of his death he flew another Bf 109, also marked 'L'. The cowl hails from a different aircraft, or was resprayed, and carried the crest with the wolf head, the marking of III./JG 77. The Aspern Lion appeared in the marking in honor of the Austrians serving with the Luftwaffe after the Anschluss. Note the inverted radio access door on the fuselage. Tento letoun pùvodnì patøil do stavu II. (Schlacht)/LG 2, o èemž svìdèí oznaèení èerným trojúhelníkem a individuálním písmenem na trupu. Nápis HARRY SEIDEL je poctou Ofw. Albertovi Seidelovi, pøíslušníkovi 5. (Schlacht)/LG 2, který byl 15. bøezna 1941 sestøelen do moøe britskými Hurricany. V dobì smrti sedlal jiný Bf 109, též oznaèený písmenem "L". Kryt motoru pochází z jiného stroje, nebo byl pøestøíkán a nese erb s vlèí hlavou – znak III./JG 77. Zajímavostí jsou vzhùru nohama otoèená dvíøka k radiostanici na trupu. Photo 01: The Luftwaffe's only dedicated ground-attack unit, II. (Schlacht)/LG2, was very active during the campaigns in Yugoslavia and Greece, and when the Gruppe was recalled to prepare for action in Russia, it left behind some of its aircraft which were then taken over by III./JG77. This machine is presumed to have crashed as a result of combat damage, and although the markings are those of II. (Schlacht)/LG2, the machine may not have been operated by that unit when this photograph was taken since the badge on the nose, probably painted over the original badge of 5. (Schlacht)/LG2, is believed to have been a variation of the wolf's head used by III./JG77. Messerschmitt Bf 109E of III./JG77, Balkans, 1941 Despite the prominent fuselage markings of II. (Schlacht)/LG2, it is believed that this aircraft, either an E-4/B or an E-7, was later acquired and flown by III./JG77. Photo 01: One of the aircraft employed as a fighter-bomber for attacks on British shipping and gun positions on Crete was this machine of 9./JG77, seen here with its wheels covered to protect the tyres from the sun's rays. Photo 02: show the aircraft with four 50 kg bombs, while in the view. Photo 03: the rack has been changed and the aircraft has been armed with a single 250 kg weapon. Just visible in this view, too, is the black triangle of II. (Schlacht)/LG2 which, up until 30 April, had been operating this aircraft. 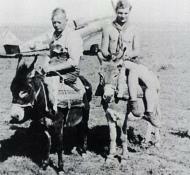 Photo 04: Lt. Emil Omert on Molaoi airfield with the same machine loaded with a with a 250 kg bomb. Note the yellow cowling and the Blue 65 replacement panels which were fitted immediately behind the spinner and on both sides of the nose over the exhausts. Hans-Jakob Arnoldy was born on 1 June 1916 at Wittlich. Arnoldy was posted to 4./JG77 in September 1939. He recorded his first victory on 12 April 1940, when he shot down a RAF Hampden twin-engine bomber attacking shipping near Kristiansand. On 26 October, Leutnant Arnoldy was injured in the crash-landing of his Bf 109E-7 (W.Nr. 6090) 'White 5' following damage received in aerial combat near Bergen. Arnoldy was to claim six victories while based in Norway. In April 1941, Arnoldy was operating over Greece. On 14 April 1941, Arnoldy engaged RAF Hurricanes as they were taking off from their airfield at Larissa and shot one down as his seventh and last victory. He was wounded in the chest by fire from Canadian ace Flt Lt John Mackie's (7 victories) 33Sqn, RAF Hurricane and baled out. As he floated down over the airfield Greek soldiers fired on him. It is not known whether he was hit again but he died within a short time. His aircraft, Bf 109E (W.Nr. 5277) 'White 5' made an almost perfect belly landing and was virtually undamaged; just two bullet holes below the cockpit hood, in line with the pilot's chest. 1 11.6.1940 14:25 Hudson 4./JG77 Trondheim Skua? Remarks: Flugbuch. Belly landed his 'Yellow 8' at Tronheim-Vaernes on 23 October, 1940, pilot disposition unknown, a Gefr at the time. Uninjured in a second crash, 8 March, 1941 when he made a crash landing at the Brest-Langedoc airfield (A. Rosseels). Remarks: POW 20th May 1941 ; belly landed on a Crete beach after being hit by flak. Injured in a crash 16 December, 1940, crashing at the Brest-Guipavas airfield, cause unknown (A.Rosseels). One known victory, his 1st, a Hampden 12 April, 1940, no location. His 2nd, another Hampden southwest of Stavanger, 24 April, 1940. His 3rd, a Blenheim at Stavanger, 25 June, 1940. A 4th a Blenheim NW of Stavanger on 9 July, 1940. His 5th & 6th both Blenheims in the Aalborg area on 13 August, 1940. A 7th a Blenheim W of Stavanger on 20 October, 1940. His 8th a Bf 109E (Finnish?) at Belgrad on 6 April, 1941. His 9th victory, a Blenheim at Amphiklia on 18 April, 1941. His Werk # 1539 was 90% damaged on 16 September, 1940 from a landing accident at the Vaernes Norway airfield, pilot OK (Source: SIG Norway). Remarks: WIA 20th April 1941 ; made a force landing at Larissa after being hit by flak. Remarks: KIA 24th April 1944 in 'Yellow 1' over Finta Mare after attacking American bombers over Ploesti. He had to bail out and was alledgedly killed while parachuting down. WIA 13 July 1943 in Wk# 18447 during aerial combat. 700 missions, including 125 close support sorties. 50 victories in the East. His 1st, an IK-2 at Belgrad on 6 April, 1941. 5 Soviet bombers on 26 June, 1941 along the Romanian coast. His 40th victory, an R-5 on 24 January, 1942. A LaGG-3 on 12 September, 1942. At least 5 victories in the Desert. Additional victories included 25 AC destroyed on the ground and on Soviet motor torpedo boat sunk. His 65th victory, a Spitfire IX 15 km NE of Nettuno on 19 February, 1944. Two B-24's in the Balkans on 5 April, 1944. His 69th a B-24 on 15 April, 1944 in the Balkans. His 70th a B-24, also in the Balkans, on 21 April, 1944. Bowers/Lednicer, 70 victories. It was extraordinarily hot on Molaoi, the airfield at the southern end of the Peloponnese, and the ground crews especially were under great stress. The fine dust deposited on the engines and airframes resulted in supercharger damage and the fuel booster pumps became clogged. The consumption of lubricating oil was unusually high and; since the oil temperature was 9.5. to 100°C, oil changes were frequently required. With temperatures off up.. to 40°C, the ground crews naturally preferred to work naked to the waist but the FliegeRGuhrer, von Richthofen, demanded that the men wear their black working clothes. In the Gruppe's opinion, this was a foolish order, so we posted an additional lookout who was to watch for any approaching Fieseler Storch staff aircraft. When one was spotted approaching the airfield, the lookout raised an alarm and the ground crews quickly got dressed again in their black working clothes. The operational! missions to Crete put a great strain on our nerves and before taking off we could only pray that our engines would not give trouble. The outward trip over the sea was 160km and then we had to make the return flight, sometimes with damaged engines, and our greatest thought was, 'I only hope I don't get engine trouble'. Over the sea we had to endure the terrible heat in our cockpits and I never saw any ships which might have saved our lives had we been forced to come down in the sea. On 19 May, Oblt. 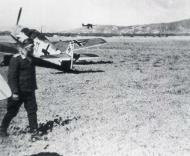 Huy led a Schwarm from 7.Staffel for a strike against positions on Maleme airfield, on Crete. I was one of the pilots. We took off early in the morning while it was still dark and foggy. It was an impressive flight, high over layers of haze and mist which prevented us from seeing the water. Our orders were to carry out low-level attacks against the British anti-aircraft positions at Maleme. As we dived down from 4,000 metres, the British anti-aircraft guns opened up, their red tracers coming up at us in a withering wall of fire. At the same time, the white tracers from our cannon and machine-guns flew downwards until ours shells disappeared into the British positions. We were lucky to return without being seriously hit, but despite the large number of operations carried out, we were unable to destroy the AA defences with cannon or bombs because the positions were perfectly built and difficult to recognise. A serious drawback which become evident in our strafing operations was that the Bf 109 - with its vulnerable cooling system for the liquid cooled DB60F engine - was quite unsuited to low-level ground-attacks.